Drugs And Alcohol: Why Is It Dangerous To Mix Ethanol And Meds? Why Is It Dangerous To Mix Alcohol And Drugs? 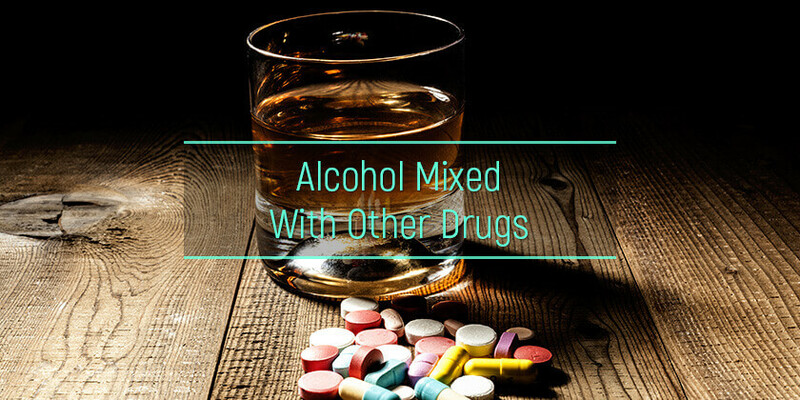 Mixing drugs and alcohol can lead to serious physical and mental health problems. The two substances amplify the effects each cause and increase the likelihood of developing an addiction to drugs and alcohol. In addition, dangerous interactions can occur between alcoholic beverages and prescription medications or illicit drugs resulting in life-threatening health complications, overdose, and death. Why is it dangerous to mix alcohol and drugs? Let’s find out. What are the interactions between alcohol and other drugs? What are the health complications of ethanol and illicit drugs? What are the legal issues with drugs and alcohol? What are the financial problems related to alcoholism and substance abuse? How are risk-taking behaviors connected with drinks and drugs? Alcohol, tobacco, and prescription or illicit drug use are responsible for one in four deaths in the United States. Concurrent Use: Alcohol and tobacco are among the leading causes of preventable deaths. According to the NIAAA, smokers are more likely to drink and drinkers are more likely to smoke. Enhanced Effects: Combining alcohol and weed enhances the effects of drugs and alcohol on the brain. Ethanol is known to increase the effect of THC, the main psychoactive constituent of marijuana. Studies have found the combination results in higher blood THC levels because the liver metabolizes the ethanol first. Worsening Symptoms: Alcoholic drinks can improve mood in the short-term, but lead to worsening anxiety and depression overall, which is why alcohol and antidepressants should be avoided. Increased Side Effects: The combination of alcohol and muscle relaxants can result in increased side effects such as dizziness, drowsiness, confusion, weakness, and impaired judgment, resulting in accidents and injuries. Cardiac Problems: Paint thinners, glue, markers, and gasoline are inexpensive, easily available, easy to conceal, and provide a quick high. Not only is it dangerous to abuse these substances, but inhalants mixed with alcohol can lead to a number of short and long term effects of drugs and alcohol including cardiac arrhythmias and cardiac arrest. Respiratory Depression: Alcoholic beverages are central nervous system depressants and slow down vital body functions like breathing and heartbeat. Barbiturates and alcohol taken together can result in a fatal cessation of heart and lung function, resulting in death. A similar effect is seen with alcohol and sleeping pills. Gastrointestinal Complications: Drinking while on treatment with certain prescription medications like prednisone can lead to peptic ulcers because steroids and alcohol both irritate the digestive tract. The combination of NSAIDs and alcohol can also cause an upset stomach, and in combination with aspirin, an increased risk of gastrointestinal bleeding. Mood and Memory Impairment: It is well known that alcohol and other drugs alter mood. For example, the combination of benzos and alcohol has a synergistic depressive effect on the body, leading to mood swings, behavioral changes, and a significant impairment in memory. Mixing alcohol and psychedelics like LSD (acid) can result in hallucinations, insomnia, and extreme changes in mood. Serious Interactions: Can you drink alcohol on antibiotics? 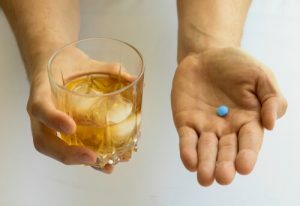 Drinking must be completely avoided with certain antibiotics as this can result in a dangerous interaction with ethanol. Symptoms may include flushing, irregular heartbeat, headache, dizziness, and drowsiness. Sedation, Unconsciousness, and Coma: Opioids are prescription pain medications that have an effect on the amount of oxygen that reaches the brain. Mixing opioids with alcohol can result in increased risk of intense sedation, loss of consciousness, and coma. Warning labels strongly advise against mixing Suboxone and alcohol because the former is a partial opioid agonist. It is also best to avoid antihistamine and alcohol which can cause increased sleepiness. Overdose and Sudden Death: Cocaethylene is a deadly byproduct of mixing stimulants like cocaine and alcohol. It can lead to unpredictable effects and is associated with 18-25 times higher risk of overdose and sudden death. Illicit substances, prescription medications, and alcohol have the capacity to cause more than just health problems. They can result in serious legal trouble, including fines, arrests, jail time, and a permanent criminal record. The use of drugs and alcohol in the workplace can lead to lost licenses, unemployment, and difficulties finding a new job in the future if background checks show a conviction for an alcohol or drug-related crimes. People who are caught using or dealing in illicit substances or driving under the influence may find themselves facing divorce, custody battles, and other legal action. Heavy drinking and illicit drugs are implicated in many severe acts of violence, which can have far-reaching legal consequences. The combination of drugs and alcohol can have devastating consequences on a person’s health, relationships, profession, finances, and legal status. The first step towards treatment and recovery is accepting there is a problem and becoming motivated to do something about it. It is quite common for alcohol and other drug use disorders to co-occur. Quitting drugs and alcohol require an empathic, non-judgmental, and accepting atmosphere that encourages honesty in self-reporting use. Addicts who try to quit drugs and alcohol on their own are at risk of dangerous withdrawal symptoms and fatal health complications. Professional help with drugs and alcohol abuse at an inpatient or outpatient rehab facility is critical to successful recovery. AlcoRehab » Why Is It Dangerous To Mix Alcohol And Drugs?